To assess the extent of problems with descriptions of treatment we prospectively assessed 80 consecutive studies selected for abstraction in the journal Evidence-Based Medicine from October 2005 to October 2006. The journal is aimed specifically at doctors working in primary care and general medicine, and it provides summaries of research that is highly relevant to clinical practice. 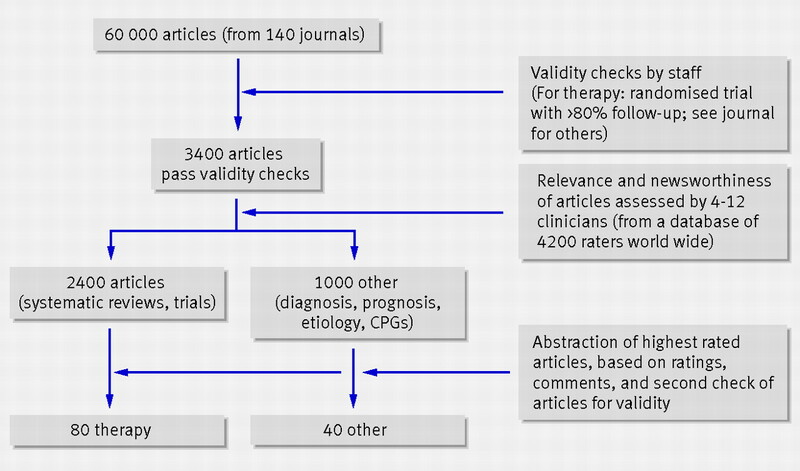 To select studies, the staff of the journal hand search 140 or so high impact clinical journals, selecting only articles of sufficient validity and relevance to warrant changes in clinical practice.9 The 5% of articles that pass the validity criteria are scored for clinical relevance by active primary care (and appropriate specialty) clinicians. A dozen or so clinicians, from a pool of several thousand, score each article. The articles that were scored as most relevant to practice are then abstracted (fig 1⇓). For each study two general practitioners (PG, CH) were independently asked whether they could use this treatment with a patient if they saw them tomorrow. Of the 80 published reports of treatment, 55 were single randomised trials and 25 were systematic reviews; they were published in New England Journal of Medicine (10), Cochrane Database of Systematic Reviews (9), Lancet (7), JAMA (7), Archives of Internal Medicine (6), BMJ (5), Annals of Internal Medicine (5), and several other journals (31). Most (65) were of treatments directly applicable in general practice; the remainder were relevant to general practice but were targeted at surgery (6), emergency medicine (5), internal medicine (3), and dental medicine (1). More than half (44/80) were of drug treatments. Non-drug treatments were education and training (15), devices or surgery (10), psychological treatments (4), service delivery (3), and a mix of other interventions (4). Elements of the intervention were missing in 41 of 80 of the published descriptions. Information was better in reports of individual trials than in systematic reviews, and for drug treatments than for non-drug treatments. Information was also better for control interventions, with 58 being sufficiently well described (22 as drugs and 36 as non-drug controls); the remaining 22 were simply described as placebos. What elements of treatment do authors miss? The missing element was most often the description of the process, but several studies were missing handouts or booklets—for example, the name or source for a self help booklet trialled for irritable bowel syndrome. Table 1⇓ shows the missing elements encountered and their resolutions. Can authors supply the missing information? When information on any aspect of treatment needed for clinical use was missing we tried to find a solution. We first retrieved references from the paper relevant to the treatment description, searched the internet and other bibliographic databases as required, and emailed study authors (up to three times). We gained some missing information for most study reports; 52 of 59 authors replied. By this simple measure the completeness of treatment descriptions improved from 49% to 76%, and improved similarly across all categories (fig 2⇓). 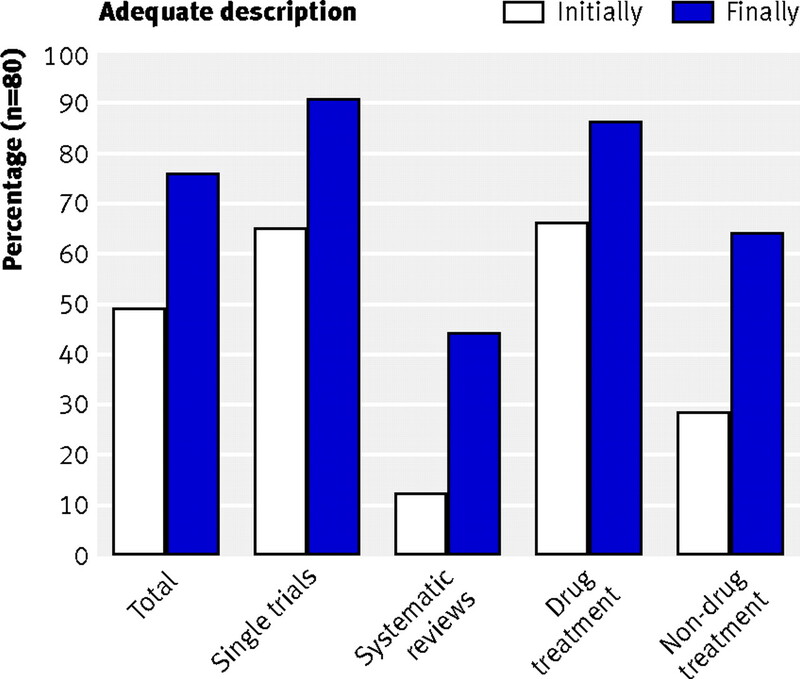 Fig 2 Percentage of studies with sufficient description of treatment initially (based only on the published paper) and after supplementary information was obtained. Some authors were extremely helpful in providing additional information. Some volunteered manuals and videos that would form part of the treatment; they were often willing to allow free access to such resources via the internet but had not included such a suggestion in the original paper. For example, one study of “cognitive therapy” had been specifically adapted and tailored for schizophrenia; this required specialised training for which an author was willing to provide considerably more detail than had been published in the journal: “[I] would be delighted for you to include the manual and information booklets in downloadable format . . . it is really important that they are available in the public domain.” Others were less able to help: for a software program to guide nurses in telephone counselling, the authors stated that it was available but not for public use—but this had not been indicated in the publication. Others had concerns about providing sufficient details because of the skill level needed to carry out the treatment. For example, the responding author of a smoking cessation worksheet said: “[The authors of the worksheet] have asked that we do not post this online. The rationale is that people really have to be thoroughly trained in terms of how to use the form.” No details on how to obtain such training had been described in the paper. Despite our attempts to get further information, elements of the treatment were still missing in 19 studies. Some examples of these are detailed in table 2⇓. While some of the missing detail is intrinsic to the complexity of certain treatments, providing some additional and readily available information would allow a greater use of published research in clinical practice. Many authors were willing to provide extra details and materials so that their treatment could be used, but clearly this had not been required by most journals. So how might reporting be improved? For trials, the CONSORT statement asks for “Precise details of the treatments intended for each group and how and when they were actually administered,”10 but further guidance would be helpful. A more detailed checklist about the “who, what, when, and where” of the treatment is desirable but may need to be tailored to different types of interventions. For non-pharmacological treatments the details are often complex, and a recent extension to CONSORT (available at www.consort-statement.org/index.aspx?o=1068) requests extra details on the components, the procedure, including tailoring to individuals, standardisation, and adherence. Full descriptions of treatment should include any procedures used; the timing of treatment, including duration and intervals of dosing or sessions; any materials needed (such as patient handouts or devices); and accessibility of any materials or instructions, including overcoming language barriers. This may need to be supplemented with graphical methods for depicting the flow and timing of sessions of treatment11 and copies of materials or handouts used. Electronic publishing provides the ideal format for distributingsuch extra material.12 For systematic reviews, statistical and clinical approaches need to be integrated to help reviewers select the most appropriate treatment(s) from among those included in the review. In systematic reviews, the high level of abstraction used in selecting “similar” treatments causes a problem. Even when reviews and trials include enough details of the treatment, the clinical reader may find it difficult to select the version to adopt in practice, especially if there is heterogeneity of effect among the treatments. Several formal and informal options can be used to decide the appropriate treatment in practice. For example, selecting the treatment with the largest apparent benefit seems sensible but has several dangers. In particular, a small trial may have a large effect by chance. The treatment used in the largest trial is not necessarily the most effective one. The QUOROM statement asks reviewers to report “details of intervention” of trials,13 and the Cochrane Handbook provides more on how to describe complex interventions (Section 7.3.4) and their fidelity,14 but neither currently gives guidance on how to select and report the appropriate versions of the treatments reviewed. Access to such complete descriptions should not be restricted. Development of a repository of treatment descriptions, particularly for non-drug treatments, would help clinicians and be supported by many authors. An example of such a process is the Centers for Disease Control and Prevention’s Replicating Effective Programs (www.cdc.gov/hiv/projects/rep), which aims to provide detailed packages and resources in HIV prevention. Without such descriptions and programmes, tens of millions of pounds of research effort could be wasted each year because effective treatments can’t be implemented or will lack fidelity when applied. We thank all the authors who responded so helpfully; and Iain Chalmers, Sara Schroter, Muir Gray, Doug Altman, Brian Haynes, Mike Clarke, and Andy Oxman for helpful comments on the paper. CH and SS are funded by Department of Health Research Development Award and Evidence Synthesis Award respectively. PG had full access to all of the data in the study and takes responsibility for the integrity of the data and the accuracy of the data analysis. Contributors: PG conceived the study; EM was project manager; CH and PG assessed the target treatments and SS assessed the control treatments; EM with assistance from SS coded, entered, and analysed the data; all authors contributed to the concepts and writing of the paper. PG is guarantor. Funding: BMJ Publishing Group partially funded this research. Dopson S, Locock L, Chambers D, Gabbay J. Implementation of evidence-based medicine: evaluation of the promoting action on clinical effectiveness programme. J Health Serv Res Policy2006;6:23-31. Pathman DE, Konrad TR, Freed GL, Freeman VA, Koch GG. The awareness-to-adherence model of the steps to clinical guideline compliance. The case of pediatric vaccine recommendations. Med Care1996;34:873-89. Glasziou P, Haynes B. The paths from research to improved health outcomes. ACP J Club2005;142:A8-10. Wallman KE, Morton AR, Goodman C, Grove R, Guilfoyle AM. Randomised controlled trial of graded exercise in chronic fatigue syndrome. Med J Aust2004;180:444-8. Mayo-Wilson E. Reporting implementation in randomized trials: proposed additions to the consolidated standards of reporting trials statement. Am J Public Health2007;97:630-3. Wallman KE, Morton AR, Goodman C, Grove R. Exercise prescription for individuals with chronic fatigue syndrome. Med J Aust2005;183:142-3. McKibbon KA, Wilczynski NL, Haynes RB. What do evidence-based secondary journals tell us about the publication of clinically important articles in primary healthcare journals? BMC Med2004;2:33. Begg CB, Cho MK, Eastwood S, Horton R, Moher D, Olkin I, et al. Improving the quality of reporting of randomized controlled trials: the CONSORT statement. JAMA1996;276:637-9. Chalmers I, Altman DG. How can medical journals help prevent poor medical research? Some opportunities presented by electronic publishing. Lancet1999;353:490-3.